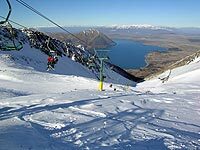 Located on the Tekapo side of the Two Thumb range, Roundhill Ski Area has superb views of Mt. Cook, Lake Tekapo and the Mackenzie Basin. 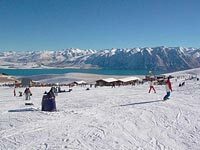 The gentle, undulating slopes of the ski area provide an ideal environment for skiers, boarders, families and groups. 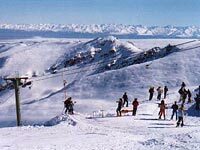 Located on a southern face of the Two Thumb mountain range is the Mt Dobson Ski Area. With 400 hectares of accessible terrain, Mt Dobson caters for the learner right through to the expert. Mt Dobson's car park is the highest in New Zealand at 1725m (5500ft). 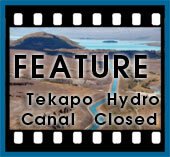 Nestled under the slopes of Mt John, beyond the Motor Camp lies Lake Tekapo's exciting new Tekapo Springs. The Winter Park sports a large ice rink for providing ice skating, ice hockey and curling events. A 100 metre snow tubing slope with purpose built contouring provideds a great activity for both young and old. > Link awaiting more information.